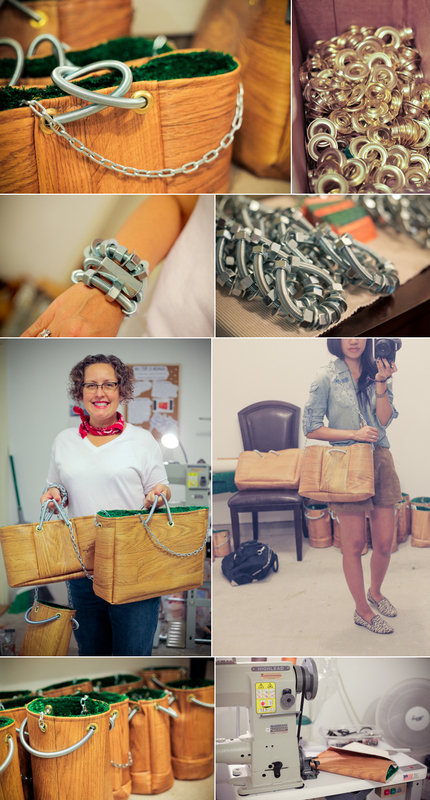 meet Julie, designer and founder of hardware couture - a local artisan from Houston. i'm always inspired by creative individuals so i was especially excited to go visit her at her workshop and check out her goods. so the theme - all the materials can be found at a hardware store and she hand makes them herself in her shop. BUSY LADY. i understand how that feels. start ups. ANYWAYS. it's pretty much wearable art. it may be a little bit quirky, but definitely unique there's a small variety of bags and bracelets for now. imagine having actual hardware for your arm candy. too bad they were too big for my wrists, but i nabbed the 'river oaks' tote and while there helped with suggestions on configuration of the shoulder strap and handles. faux wood bag? why yes please. astro turf lining? why not? i'd say this bag is picnic ready. if you're in town and interested you can find these goods at the spacetaker WHAM event on Nov 16-18 or at roundtable goods in the Heights. That's great stuff. Very innovative. Thanks for visiting me. Do you like to follow each other on GFC and bloglovin? Let know will love to follow back. I love these things!! Industrial and original! Ps Thanx for stopping by and I hope you wanna follow each other in all platforms we have in common! You are doing a great job here! These pieces are so original. I'm sure Julie is a successful designer. yes i love hardware inspiration!! never thought hardware could be used in such an innovative way! How neat is this - it's always fun to discover a new artist in Houston. WHAM looks so fun too! be part of this workshop! !